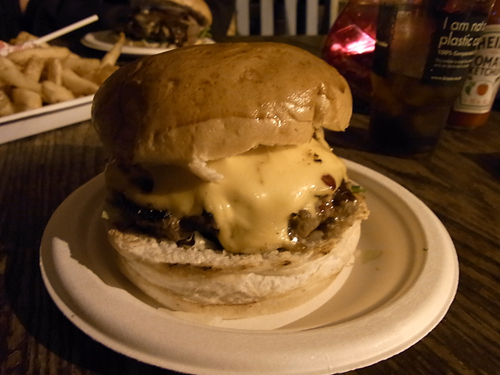 COOL: Lucky Chip.The best street burgers in London, if not the world. | Everything is cool. 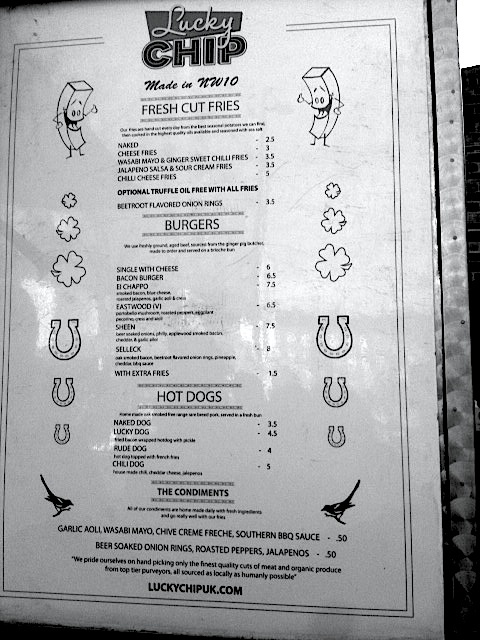 COOL: Lucky Chip.The best street burgers in London, if not the world. Various burger blogs sussed these guys out ages ago, but we just lost our Lucky Chip virginity. And now we’re pregnant. It’s street food, but you still get to sit down at a table with plates and stuff. 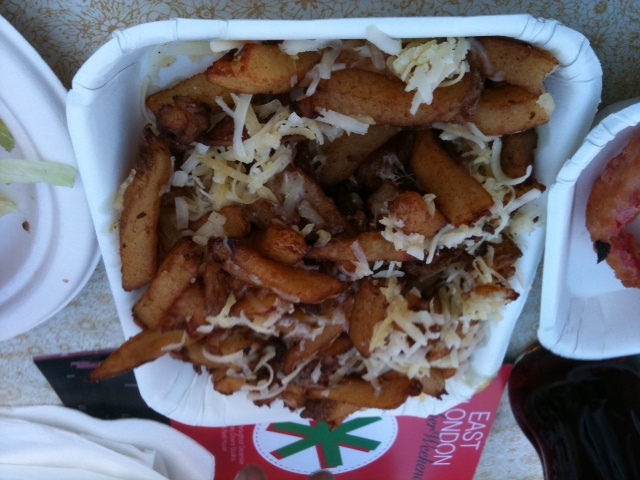 We went to the burger van in Netil Market, E8. The cheapest burger is a Single With Cheese at £6, and total heaven. Personally, we think it’s best to start simple and then work one’s way up. 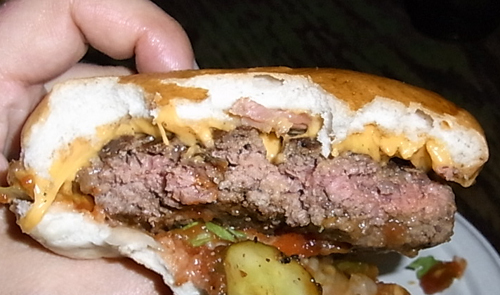 The meat tastes of meat; soft, marrowy and evidently cooked by burger fanatics. Interestingly, Ben Denner, who runs Lucky Chip recently changed meat supplier, from Ginger Pig to Walter Rose and Son. Hearing some horrific tales about Ginger Pig recently, not to mention a personal incident involving some veal shin, a refrigerator, 24 hours and loads of maggots. The added beauty of Lucky Chip is the truffle oil option. It really is the perfect condiment for chips and burgers. Oh go on then, maybe a side helping of aioli too. Yeah, Lucky Chip’s not exactly for dieters. Then again, neither is this blog. Be warned though. There’s so much flavour in every bite, the post-munch blues hit you pretty hard. But, hey, at least the bun didn’t fall apart. Buns of steel, these. Best thing on the menu. Cheese Fries. Doused in truffle oil. 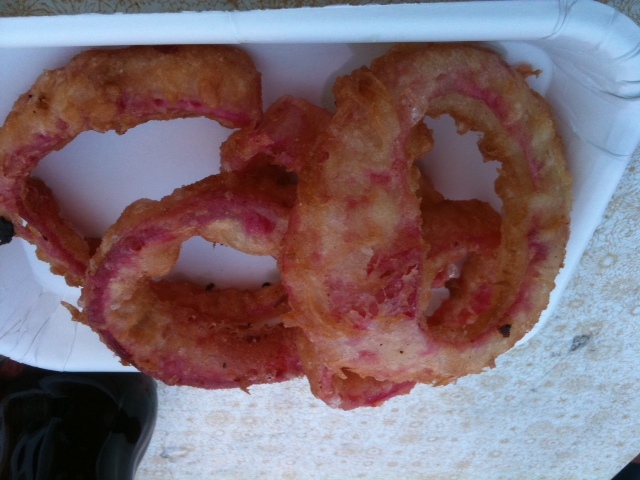 Beetroot onion rings. Why the hell not? We didn’t need these but the beetroot does add something. Colour? Maybe. *Burger lovers get involved and let us know what you think! To take in the stunning scenery of Italy’s finest islands try a trip to the sunny islands of Sicily or Sardinia. Beach breaks may be consumed in the stunning places of Viareggio and dei Marmi. many miles of marvelous sandy beaches rendering it a terrific family holiday break for people who like build sand castles and to get paddling. beaches nearby, frequently connected for the hub of area by bus. visit with galleries showcasing masterpieces of most size, design and description, in the world. When you’ve got the option, choose dark roast instantaneous espresso over regular. The flavour of darker roasts might be extra just like the power of the espresso powder.